This is a traditional solution using a chipset with the integrated graphics core (mATX board). We got a preproduction sample, that is why it doesn't have many accessories with it. utilities for the smart card reader. The layout is quite good for the microATX version, however there are some typical drawbacks: audio-ins are between the AGP slot and the 12V power connector, IDE, FDD and power connectors which are located too close to each other make problems when connecting/deconnecting cables, and when a video card is installed it's difficult to handle the memory modules. It can also be difficult to reach jumpers when the board is already installed. Their functions are shown on the textolite. The 3-channel switching voltage regulator incorporates 9 capacitors of 2200 uF and 3 of 1200 uF. The following controllers are integrated: an audio one based on the chipset's capabilities and AC'97 codec Avance Logic ALC201A with an output for front audio connectors; a network one based on the Realtek RTL8100B chip. The ITE IT8712F-A I/O controller allows working with the smart card readers. The board doesn't have non-unsoldered connectors. The system monitoring is supported by the ITE IT8712F-A chip. Processor voltage (+/-3.3, +/-5 and +/-12 V), speed of 2 fans and temperatures of the processor (a built-in sensor) and the board (a built-in sensor) can be controlled. There are 2 connectors for adjustable connection of the fans. 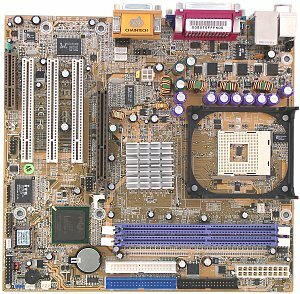 Brief characteristics of the board: memory slots - 2 DDR SDRAM; expansion slots - AGP/ 3 PCI/ CNR; I/O ports - 2 COM/ LPT/ 2 PS/2/ 4 USB 2.0; dimensions - 245x230 mm. We used the latest available version of the BIOS of 21/03/2002. 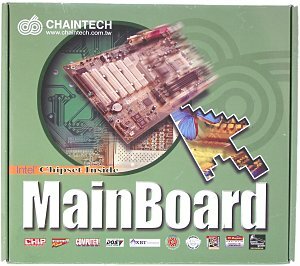 Good functional capabilities, excellent speed and almost lacking overclocker's tools is the impression this board leaves.